Sam Hulley is a new name around these parts. I wasn’t looking for an intern, but up popped his name in my Facebook messages asking if I had any positions for the uni summer break. I hadn’t given the idea any thought, but seeing as he’s had the nouse to ask, I decided that I should give him and the wider idea of an intern a go. And I couldn’t be happier. Sam has quickly proved himself as a valuable member of the team. Interns generally get to do the crappy jobs that the bosses don’t want to do. But right from the start, he’s proved himself clearly capable of more than just making tea, although I did have to show him how not overfilling the cups makes them easier to carry. While playing around with this DJ Tech Dragon Two unit, he seemed genuinely interested and appeared to like the experience. So I figured the best way for him to learn is to chuck him in at the deep end of reviewing, with the safe knowledge that he starts on a positive footing. I did of course, as any good editor does, point him the right direction with a few pointers about what to look for from such a device. And what has come back is a review that really represents the product very well indeed. Good work Sam! DJ Tech has recently been shaking things up within the DJ market with the release of the DJ Tech DIF-1S. This 2 channel battle mixer injected with a mini innoFADER demanded the term ‘value for money’, and with DJ Qbert giving it the thumbs up with a Thud Rumble Edition, this seemed a no brainer for a lot of people. Showcased at NAMM 2012, the DJ Tech Dragon 2 managed to make its way inconspicuously into to general market without receiving much attention from the public. Currently marketed at $289 this slips into the price range of the Numark Mixtrack Pro 2, although after playing with this unit, it is clear that more suitable comparisons should be made with the Native Instruments Kontrol S2 and other more expensive units. The DJ Tech Dragon 2 is a 4-deck controller with a built-in 2 channel analogue mixer that ships with Virtual DJ LE 4-deck edition. Covering all the basics comprehensively, this unit doesn’t stray far from the beaten track, managing however to include some neat little features within a fairly familiar layout. Not all black. Recently a stream of sleek looking, predominantly black controllers have floated their way into the market, so seeing a unit with a nice light finish was actually refreshing (we won’t talk about the Native Instruments “esque” piano black mixer section collecting dust and finger prints as I write this). The contrast between the dark controls and light faceplate gives great visibility in even the darkest booths, supplemented by all buttons being backlit. Headphone tone control. I have never seen this included on a mixer before and is a smart little addition by DJ Tech. Build wise, this is all-metal and feels genuinely solid. Unfortunately the faceplate has been secured by screws that are not only very visible, but don’t all fit flush with the unit. All the knobs sit on metal pots so will stand up to a substantial amount of abuse, and nothing on this unit feels like it is going to fall apart in your hands. Solid pair of 4” jogs with a touch sensitive platter and a red light that travels around the jog as the music plays. The sensitivity of the platter can be altered using a knob on the back of the mixer to tailor these to an individual’s needs. Tight integration with VDJ allows the jogs to be very responsive, although my personal gripe with these is that they are not easy to grip and I found my fingers sliding around when using them. Filters – Dedicated filters for each channel is quickly becoming one of the most desirable qualities of a mixer. Not only do the Dragon 2 filters play nicely with software, they also double as analogue filters for when using as a stand-alone mixer. The filters are pleasant sounding, albeit they are pretty ineffective between 11 and 12 o’clock. My favourite characteristic of the filters is that of the lights surrounding them. When the filter is engaged and not at neutral position, the surrounding amber light gently flashes. Perfect for me as I am a sucker for forgetting my filters are left on when bringing in a track. Faders – Line faders have a slight resistance and unfortunately have a fixed curve. In this price range however I don’t think much else could be expected. In terms of the cross fader, this is another story. Adjustable curve, smooth feel and a short cut in, will appeal to scratch DJs out there. A little switch on the front of the unit gives the option to allow the cross fader to send midi. 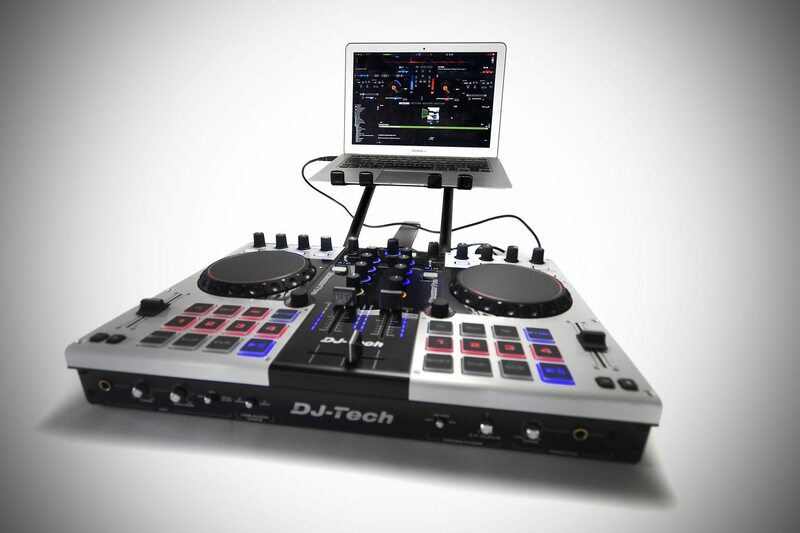 DJ Tech advertise this as perfect for VJays who may want to use the cross fader to perform smooth video transitions. I can’t see the average user using this function much; even so it’s always nice to have the option. Deck Switches – Stiff metal switches allow the user to change from decks A and C to B and D. A change in the EQ lighting visually lets the user know which decks the mixer section is controlling at that moment in time. Soft takeover and controlling 4 decks using 2 sets of EQs is still something that I am not convinced by. I am sure many do this seamlessly, but for me it is just awkward (agreed Ed). These are fairly stiff with a centre click, this pitch fader sits very firmly in the “it’s a pitch fader” category. Located directly below are pitch bend buttons personified in small rubber squares with a very pleasing ‘click’ when pressed. They change pitch and bend it, so no surprises here. The sampler and effects section is located on the top left of the unit. 4 knobs and 4 buttons give enough of a control surface to effectively use both the sampler and effects in VDJ. Each button launches a different sample, and then the knobs control and trigger different effects (2 knobs per channel) by rotation or being pressed. The shift function also unlocks another layer of controls, increasing the functionality. Hard plastic buttons are employed here, and although feeling a little cheap, they do the job, assisted by blue backlighting. 12 performance pads dominate the area underneath the jog wheels, natively used for transport controls, 4 hot-cues, 3 loop controls, shift and last but not least SYNC. Backlit and large, these easy to hit pads feel nice to use and the spacing between them decreases the risk of accidentally hitting the wrong pad. A good few minutes of scratching and attacking these buttons with my nails and other implements left absolutely no sign of visual wear and tear, proving again that DJ Tech have built the Dragon 2 to last. Each channel is equipped with an endless encoder for assigning and implementing auto-loops. Visual aid is given by a ring of LEDs around the encoder and allows for quick manipulation of loop lengths on the go. Twist to change length, click to activate, simple! The DJ Tech Dragon 2 has a choice of unbalanced RCA and balanced XLR master outs, with the option of an RCA booth out. Phono and Line inputs are available for each of the analogue channels to accommodate for Turntables, CDJs and other media players. The now fairly standard choice of jack or minijack headphone socket is expected, although a lovely feature included is a tone knob to tailor the sound to personal preferences. Little additions like this are nice to see, and gives off the vibe that some real thought has been put into this product and not just trying to sell a carbon copy of everything else on the market. Microphone input is located on the front of the unit for ease of access and again features a tone control. Off, on and talk over are the three options when it comes to using the microphone which will please mobile DJs immensely as well as anyone else who likes to make an announcement every once in a while. As someone who rarely uses the mic, talk over mode actually makes the process very painless without having to guesstimate how quiet I should make the music to allow myself to be audible to the audience. Unlike Booth, Master and Headphone (where the volume knobs are located on the face of the mixer) the microphone volume is placed on the front of the mixer next to tone control. Shipping with VDJ LE 4-deck edition you would expect the unit to play nicely with the software. Fortunately, this does not disappoint. As a VDJ controller this leaves little else to be desired. Good LED feedback. Dedicated buttons to navigate VDJ’s various view options. Direct control over one effect per channel. Four sample triggers and access to 4 decks at the flick of a switch. Any gripes users will have are going to be with the software and not the controller. I had a brief play mapping the Dragon 2 to use with Traktor Pro 2, and this can be done relatively easily and works fine. There isn’t currently a Traktor mapping available for download so Traktor users will have to get their paws dirty with this one. Software – As already alluded to this unit works very tightly with Virtual DJ. Not being a regular user of VDJ I actually really enjoyed playing about with the software, and everything seemed to work smoothly and efficiently. I struggled to get to grips with soft takeover when using 4 decks, and the fact when switching between decks A and C (or B and D) the headphone cue also switches. This is a tad frustrating, as I wanted to cue decks A and C simultaneous but this cannot be done without touching the laptop. Minor issue, and to be honest the only fault I could find. Analogue – Using CDJs as inputs I thrashed out a good few sessions utilizing the Dragon 2 as a stand-alone mixer. Everything performed as it should, and I really liked the filters. The meters showing levels for each channel and the master output seemed to linger too long on the previous peak for my liking, but again this should not be a deal breaker. All things considered, the DJ Tech Dragon 2 is a quality outfit. Virtual DJ fans are going to love this, and for the price, you are getting a lot for your money. The soft take over when using 4 decks can be awkward, but as an excellent controller as well as a very capable stand-alone 2-channel mixer, the Dragon 2 ticks a lot of boxes. With a solid metal build, durability should not be a concern with the DJ Tech Dragon 2. Controls all feel suitably sturdy, although plastic buttons feel a little, well, plastic. Happily jumps between being a 4 deck Virtual DJ controller, and a stand-alone 2-channel mixer with hardware filters. Vue meters are average, but a tone knob for headphone monitoring, and talk over mode for the microphone input are nice little inclusions. The category in which the Dragon 2 excels. You would be hard pressed to find another unit (even second hand) that can compete on both price and features. Well done Sam. He’s hit just about everything that matters and painted a solid picture of what the Dragon Two is about. My own experience shows it to be a very solid unit, capable of providing an extensive cross section of all that is good in the DJ world right now. Readers should consider this as the last remnants of DJ Tech v1, the one that put out some pretty crazy ill-thought products as well as some really solid ones. The Dragon Two is certainly the latter, and has been rereleased at a cheaper price to underline the end of that particular era, and moving forward into a newer more focussed one. If you’re in the market for a does-everything DJ box of tricks, the Dragon Two will serve you well. It’s cheap yet good quality, and has a liberal scoop of all that is good in the analogue and digital DJ worlds. The one we have here will certainly be seeing some action for sure.